Pick up metal debris in tight places with a handheld magnetic sweeper. 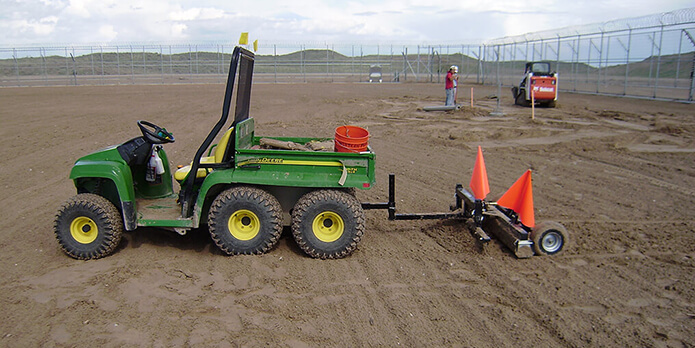 Push type magnetic sweepers with loads of features make it easy to pick up metal no matter what the terrain. Hanging magnets offer great value for picking up metal debris. Hang them from almost anything! Mount a magnetic sweeper to the rear of your vehicle when the front end needs to do other work. Perfect for forklifts! Pick up metal debris before you run over it with your forklift. These sweepers attach quickly and easily! Front mounted magnetic sweepers mount to the front of your vehicle. Specifically designed for the shot blasting industry. Makes picking up shot quick and easy! Tow behind magnets pick up metal debris over large areas quickly. We stock all of our industrial magnet products.